If you want to clobber the market in 2018—and beyond—then buying companies with accelerating dividends is an absolute must. And I’ve got good news for you: there’s never been a better time to buy them. That’s because dividend growth is on a sugar high: on January 6, research firm IHS Markit predicted that global dividends would jump 10% this year—a new record. What’s more, if you’re looking to grow your nest egg fast, you’re in luck, because accelerating dividends are the beating heart of my personal 3-step system for banking 12% annual returns for life. I’ll tell you all about this safe, simple approach, and why that 12% number is vital, in just a moment. First, you might be wondering why I’m so focused on an accelerating payout. Getting a fatter income stream is an obvious reason, but it’s just the start. Because as I wrote in December, a rising payout acts like a lever on a company’s share price, prying it higher and higher with every single dividend hike. The pattern is plain as day in this chart of NextEra Energy (NEE), a supposedly “boring” utility that’s been quietly sending its shareholders bigger and bigger dividend checks over the past five years. I’m not just pulling NextEra out of thin air here. I mention it now because IHS Markit also pegged the company for a 12% dividend increase when it announces its next hike, probably around February 9. That’s a solid raise in anybody’s books—but it is a shade below the 12.9% hike NEE delivered last year. We’ll start by looking at each part of my 3-step “accelerating dividend strategy,” designed to uncover the stocks that will deliver that 12% annual return we’re craving. Oh, and if you’ve been following my articles, you’ve probably heard me bring up that 12% number before. That’s because, as I show you in my in-depth investment report, “The Simple (and Safe) Way to Earn 12% Every Year From Stocks,” it’s enough to double your portfolio every 6 years and throw off a dividend stream that’s 3 times larger than the experts say you need in retirement. Plenty of dividend hounds simply run out and find the stock paying a high current dividend yield (6%, 7%, 8% and more) and call it a day. But that can be a recipe for disaster. 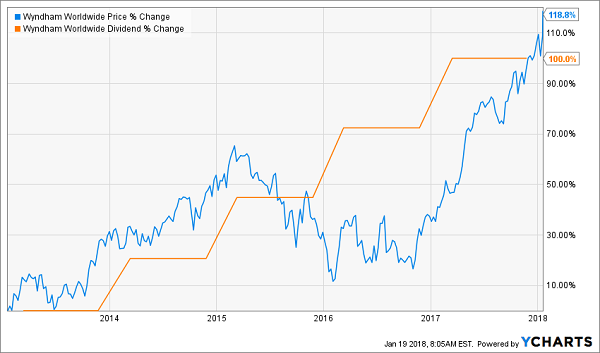 Take telecom provider CenturyLink (CTL), which is getting a lot of headlines these days because of its ridiculous 12.5% yield. But that’s entirely because, as I told you back in November, the shares have been walloped (as you calculate dividend yield by dividing the annual payout into the current share price). Check out how the dividend yield has risen as the share price has dropped through the floor. That share-price plunge won’t be reversing anytime soon, as CTL’s earnings and revenue are in free-fall, and it’s saddled with $25 billion in debt. That’s way more than its $18.5-billion market cap (or the value of CTL’s outstanding shares)! This is a textbook example of why you’re often safer with a lower-yielding stock that grows the yield on your initial buy over time. Just to swing back to NextEra for a moment, if you’d bought that stock five years ago, you’d be pocketing a nice 5.5% on your original buy today, thanks to the company’s accelerating payouts. That’s more than double NEE’s current yield of 2.6%. Or you could start building your own “hidden yield” with a stock like Boeing (BA), which dropped a 20% dividend hike on shareholders in November and has plenty of room for even bigger raises, thanks to another misunderstood measure (2, actually) I’ll show you now. If you’ve been buying dividend stocks for a while, you probably know about the payout ratio. You calculate it by dividing the total amount of dividends paid out by the company’s last 12 months of net income. If the result comes out to, say, 50% or less, you’ve got a safe dividend that’s likely to grow. As you get climb closer to 100%, the noose around the payout gets tighter. Problem is, earnings are an accounting creation and can be easily manipulated to overstate cash flow generation. But they can, at times, understate it, too. Right now, for example, Boeing has a net income–based payout ratio of 48.5%. That sounds great, but it doesn’t tell the whole story, because the company’s free cash flow payout ratio clocks in at just 29%. Because free cash flow (FCF) tells you how much cash a company is generating once it’s paid the cost of maintaining and growing its business. You calculate it by subtracting capital expenditures from cash flow from operating activities (both figures are available under the “Financials” tab on Yahoo Finance). The bottom line is that FCF is a much better snapshot of how much cash a company is truly making. And while Boeing gets a passing grade on both ratios, its higher net income–based payout ratio masks its true dividend-growing power. And that’s why I expect another 20%+ payout hike out of the stock later this year. By the way, this is precisely the opposite of the almost certain payout cut our long-suffering CenturyLink investors can expect. That company’s FCF payout ratio is 253.7%—so it’s paying out way more in dividends than it generates in FCF. 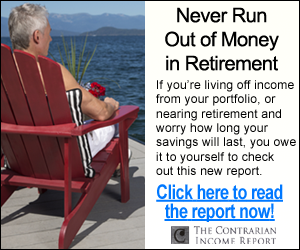 And its net income–based ratio is even worse, at 373%! 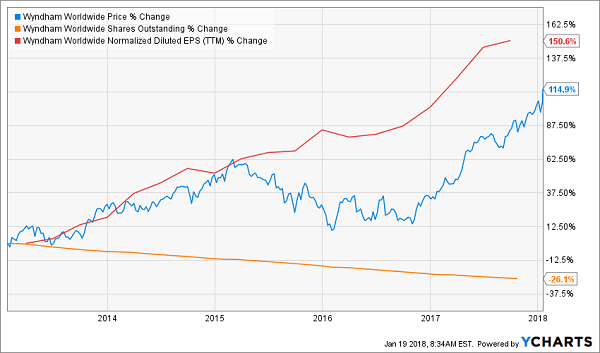 Plenty of folks see share buybacks as artificially inflating a company’s profits, as they cut the number of shares outstanding, thereby driving up earnings per share … and where EPS goes, share prices eventually follow. But one thing is clear: buybacks work. And when you throw in an accelerating dividend and a reasonable valuation, you get a recipe for a surging stock price. Check out the chart below. 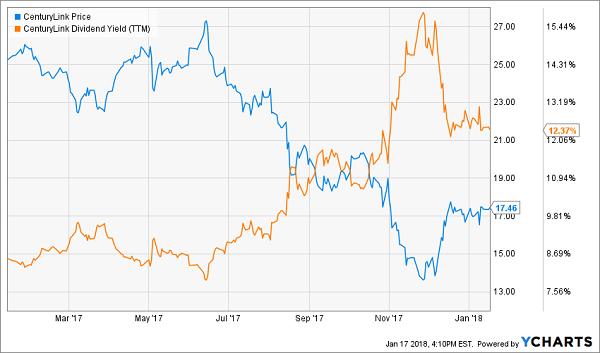 It’s no coincidence that earnings at hotel operator Wyndham Worldwide (WYN) (red line) surged as it bought back shares (orange line), pushing up its share price (blue line), in turn. Management has neatly taken advantage of the company’s valuation over the last five years, which has mostly held below 15 times FCF and has ranged as low as 9.6-times. Providing extra lift are WYN’s monster dividend hikes, which have also helped pace the stock to an easy double in that same time period. Of course, you can use the 3 steps I just showed you yourself, by using an online stock screener and poring over corporate earnings reports on your own. But it can take hours to run an analysis like that on just a handful of stocks (and of course, you’ll also want to take a peek at dividend, earnings and FCF history, as well as valuation measures like price to book value and price to free cash flow). Plenty of folks (myself included) love the challenge! But if you’d rather just cut to the chase and start pocketing your 12% annual return for life now, I’ve got you covered there, too. Because my team and I have discovered 7 stocks set to deliver that steady 12% yearly return. All 7 boast an explosive mix of accelerating dividends, timely buybacks, strong current dividends and absurdly low valuations that just can’t last. The US company that’s cashing in on surging Chinese water demand. This is one of the most boring businesses you’ll find—making water heaters—but its dividend hikes are anything but: the payout has soared 157% in just 4 years! And there are far bigger payout hikes to come! The 800% Dividend Grower. This unsung company has boosted its dividend eightfold since a new management team took over just 5 years ago! 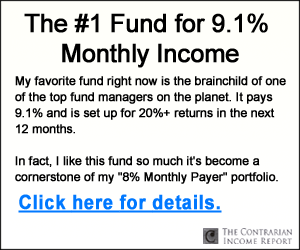 This stock is a complete no-brainer for anyone looking to get bigger and bigger dividend checks from here out. 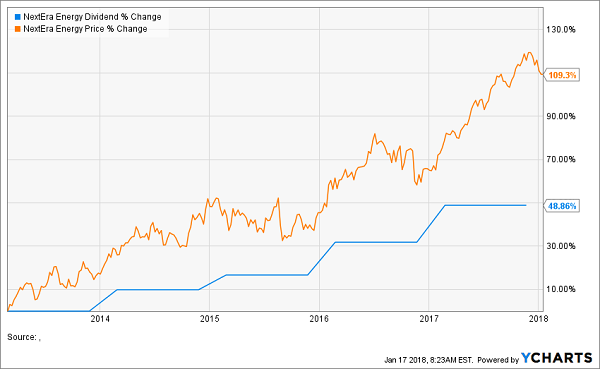 A “double threat” income-and-growth stock that rose more than 250% the last time it was anywhere near as cheap as it is now! All you have to do is CLICK HERE NOW and I’ll give you all the research I have (in plain, easy-to-follow English) on these 7 bargain “dividend accelerators,” including their names, ticker symbols, buy-under prices and more.